Cherry Tomatoes (Solanum esculentum var cerasifera): growing, planting, caring. Cherry tomatoes grow easily on balconies and terraces! 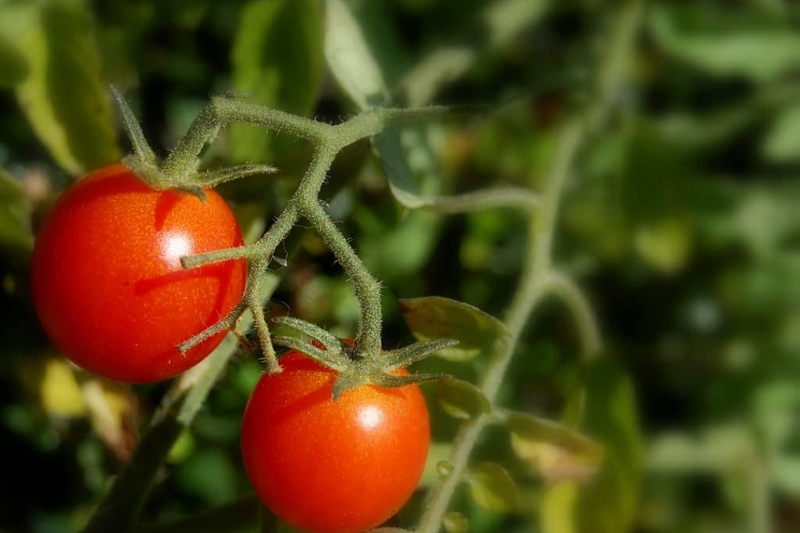 Cherry tomatoes are easier to grow than regular tomatoes - requiring very little care, they are rarely subject to diseases, and are delicious for snacks. You may commence to sow under shelter or indoors starting in February, in a greenhouse or next to a window, avoiding direct sunlight. Prepare a bed of gravel or clay pebbles to facilitate draining and prevent the roots from rotting. Add potting soil specially for sowing up to about 2/3 of the container and tamp down lightly. Then fill to the top, without tamping down the new soil. Sow your seeds, spaced approximately 4 cm apart for each seedling – a few seeds in the middle of a pot will be enough. Water regularly. It will take about a week of temperatures above 20°C before you see the first germination — this is the time when the seedlings need the most light. Sowing outside is only possible in warm climates - when temperatures exceed 20 ° C, sow directly in the sun, in fine soil mixed with sifted compost. Place 2 or 3 seeds for each square meter, and cover very little. Water gently, you will have to keep the soil moist the first weeks. If you've sown in a seeding tray, transplant the seedlings to small individual pots as soon as the first leaves appear. Continue to water regularly, eventually adding a little organic fertilizer. Tomatoes like soils that are rich in humus, ideally enriched before planting, with a great exposure to the sun! Starting in the beginning of May, once there's no more risk of freezing, place them in your planter or garden in a sunny place, sheltered from the wind. Leave at least 80 cm between each plant, allowing light to shine all over, and also to protect against disease. Useful little peculiarity about tomatoes — they can be regrown by cutting roots from the vines. Take advantage during planting — bury them deeper than the neck, tilting the root in the hole, then use a guiding stake to straighten it. If you have sown directly in open soil, then three weeks after sowing, keep only one vigorous plant per spot, and eventually transplant the others. To prune or not? For the cherry tomato there is no real need - just leave it grow. Tomatoes enjoy mostly cool, light soil that can warm up quickly, and regular, unchanging moisture. This means it's useless to water if, for example, we're talking about a plant grown in open soil — proper mulching is the best way to conserve humidity. The root itself should go 30 to 40 cm down to find water. Additionally, if you water too much at the beginning, the stem will only produce superficial roots and you'll end up needing to water them constantly! Pro tip: never water during direct sunlight: this can burn the foliage, and this wastes water. Rather, water in the late-afternoon or evening, but not too late! You risk exposing your plants to mildew if the foliage stays wet throughout the night. Also pay attention not to massacre the roots with an overpowered water jet. Favor pots with a water reserve if you're cultivating on a deck or balcony, or place saucers of water under the pots. Mulch between the plants one to two weeks after the final planting with a natural mulch which holds in moisture. Ideally, leaf and yard waste works perfectly — grass cuttings, cut branches, and dead leaves! This will limit soil evaporation and thus the need for watering and weeding. Harvesting takes place approximately ever four to six months after seeding, according to growth conditions, generally starting in mid-August and going until the end of autumn if the climate permits. You can pick the tomatoes when fully ripe, or let younger ones ripen by placing them on a windowsill. A variety of diseases are fairly common among tomatoes, but we can avoid these with a few simple steps. Mildew, unfortunately very common, causes brown marks on the leaves. Powdery mildew presents as a sort of white felt on the leaves, while aphids cause the leaves to curl in on themselves. Once mildew has gotten in your plants, it's not easy to get rid of! As soon as you see brown leaves, remove them delicately, taking care not to shake the stem and root of the plant to avoid spreading the disease. Don't compost the diseased leaves. Disinfect any tools used. As a preventative measure, you can also try spraying a mixture of water with sodium bicarbonate and a bit of black soap. Once the last fruit is harvested, if you want to use the plot again, don't forget to pull out the plants to make room for autumn plantings! Correctly remove the roots and avoid composting the remains if the foliage shows signs of disease.